Today’s Capture Your Grief topic is Before. 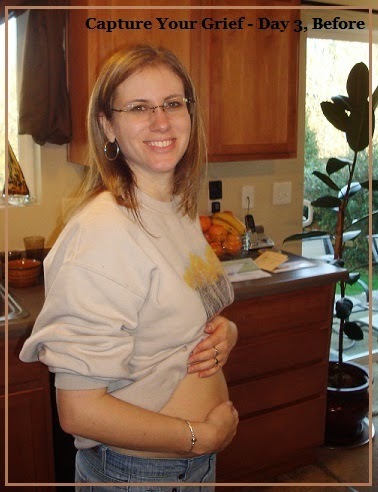 Here is a picture of me while I was pregnant with Faith. This is before she went to Heaven. I think about myself Before she came into our lives and left and I am intrigued. In once sense I am the same person, but at the same time, I will, of course, never be the same person. I look at the world so differently now. Life is so precious and so many things simply do not matter. Before Faith left us, I wore rose-colored glasses when I viewed the world. I don’t think losing a child like that ever even crossed my mind and I certainly didn’t think it was something that would happen to me. Before Faith died, I never yelled at my Father before and got more real with Him than I am today, but if I can’t be real with my Father, who can I be real with? It’s not as if He doesn’t know how I feel anyway. To be this real with Him has been a brand new experience for me. Honestly, one that has been difficult, frustrating, aggravating, loud, but at the same time, cleansing, loving, healing, and rejuvenating. Jeremiah 1:5 (AMP) says this: Before I formed you in the womb I knew [and] approved of you [as My chosen instrument], and before you were born I separated and set you apart, consecrating you; [and] I appointed you as a prophet to the nations. I choose to focus on God knowing Faith before He formed her in my womb, as my Before. While I miss her beyond words, I know that one day I will be with her again. I know that just as He knew me before I was knitted together in my mother’s womb, He also knew Faith, before she was knitted together in my womb. While it is difficult to look beyond what I know now, and beyond the pain of my loss, I choose to focus on the BEFORE that matters, the time BEFORE she was knitted in my womb, when He originally knew Faith.